Come and learn a wide range of wonderful dances, from 17th Century Jane Austen style dances to 21st Century Ceilidh Dances, including American Contra Dance, English Barn Dance, Contra Waltzing and the Polka! Beautiful flowing dances - the best of the old and the new. All danced to fabulous music from both sides of the Atlantic. Look at the videos to see what it is all about. It’s easy - just come and have fun! Get fitter and meet new people! 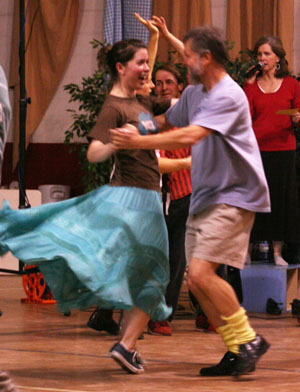 The weekly dances have an emphasis on teaching as well as dancing. If you have never done this type of dancing before we will help you to get started so that you can join in and have fun at your first session. We will also teach you lots of optional spins, twirls, variations and stepping that you can put into your dancing if you wish, so, whether you are an experienced dancer or an up-and-coming beginner, we hope to help you enhance your dancing and add to your enjoyment of the dance. Don't miss the monthly Saturday evening dances. If you are interested please let us know - send John Sweeney a note at info@contrafusion.co.uk and we will put you out mailing list so that you get all the news about dances and workshops. Or you can click here to subscribe yourself. We also have a Facebook Group that you can join. If you like dancing you will love this! If you have never danced before this is a great place to start. And if you do dance already, you can use some of your skill and style to enhance your dancing, whether it be barn dancing, ceili (ceilidh) dancing, Irish dancing, Appalachian clogging, traditional dance, Playford, country dance, Modern Jive, Ceroc, LeRoc, swing, Lindy Hop, waltz, tango, quickstep, salsa, merengue, round dancing, square dancing, line dancing, partner dancing, two-step, west coast swing or anything else. The Ashford & Maidstone Dances are the place to learn more dance skills. The halls in Hothfield and Aylesford have large car parks, and are only five minutes from J9 and J6 on the M20, so they are easily accessible from Maidstone, Sittingbourne, Faversham, Whitstable, Canterbury, Dover, Folkstone, Hythe, New Romney, Rye, Tenterden, Cranbrook, Staplehurst, Headcorn and all the villages in between. This is nothing to do with dancing, but if you are interested in board games please have a look at the Ashford Board Games Club.